1. It provides instant feedback on a matter that requires quick attention. A dirty bathroom quickly succumbs to the broken window effect. A little bit of mess left behind by one user leads others to become a little more careless, and soon enough it cascades into a full-blown disaster. People can't be asked to carefully throw out their paper towels in a restroom full of graffiti and mildew. Someone who notices a mess can use this switch to instantly alert someone with the ability (and responsibility) to clean up. 2. It reaches people at the right level of anonymity. It's like a whistleblower hotline -- the reporter doesn't have to undergo the potentially embarrassing process of reporting the problem face-to-face with an attendant (which inevitably will begin with, "I didn't leave behind the mess, but..."), nor are they required to make any kind of heroic stand by confronting the people who created the mess. In fact, the level of effort required is so low that a person would have to be nuts to not use the switch if the bathroom is, in fact, messy. Nobody has to get the attention of a staff member or wait in line to talk to a cashier. 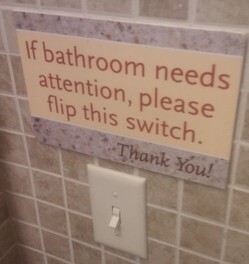 Just flip a switch and walk away. It eliminates the inevitable diffusion of responsibility that can happen when "everyone" can see the same problem -- and thus nobody does anything about it. 3. It communicates the right tone from the top. The presence of the switch alone telegraphs that the management or ownership anticipated even before construction began that bathrooms can become messy, and took steps to keep that from becoming a problem that would inconvenience their customers. When a customer flips the switch, the staff is actually getting a message from management that a priority has emerged. This page contains a single entry by Brian Gongol published on August 11, 2012 10:45 AM. Bad soap dispenser. Bad! was the previous entry in this blog. Platte Valley State Bank - Grand Island, Nebraska is the next entry in this blog.